I wish to thank Rowley for the great work he does. I’d been feeding an ibis for well over a year before heading to New Zealand for a holiday. When we returned we wondered if the ibis (Big Bird) would still visit us. Well it did, which pleased us greatly, but we could see that both of its legs were entwined with fishing line. I was also shocked to see a fish hook through one leg. I made some calls to find a rescuer that could catch wild ibis. Fortunately I found Rowley who said he would be here inside an hour. I took him to our garden and showed him Big Bird who was distressed and barely able to stand on her left leg (but of course she could still fly). Rowley set up equipment to catch her, then we retreated to the back door to wait and see if my ibis would come in for the food we’d put out. Three magpies and a currawong also saw the food. I got a little upset thinking they might ruin our chances of catching Big Bird. Rowley assured me it was OK as the ibis would fly down to get the food, which of cause is exactly what happened. “Wham” and we had her! He asked me to throw a towel over the bird to calm her down. We were shocked to discover not one hook, but two – the second one buried deep in the bird’s thigh. Rowley had to push it through so that he could cut the barb and remove the hook, which he did. The leg was quite bad but he said they are a tough bird and that she should be okay. Rowley took her to a local vet for a seven day antibiotic shot, just to be safe. Half an hour later he brought Big Bird back to this area and released her in familiar surroundings. He rang to say that she was aok but would probably stay away from our place for a while because of the stress she’d been through. Well, two days later Big Bird did fly in. Her limp is much less and she looks a lot happier and well on the mend. Rowley YOU’RE A LEGEND mate and thank you very much. On behalf of RSPCA Qld, a sincere thank you Rowley for the wonderful work you do every day of the year. Hundreds of birds, seabirds in particular, owe their lives to dedicated carers such as yourself. Your support and dedication, to all creatures, great and small, is truly appreciated. Thank you very much for answering my distress call about the injured swan. You were here in 20 minutes. We did our best but the swan couldn’t be saved. Good on you Rowley, we tried. 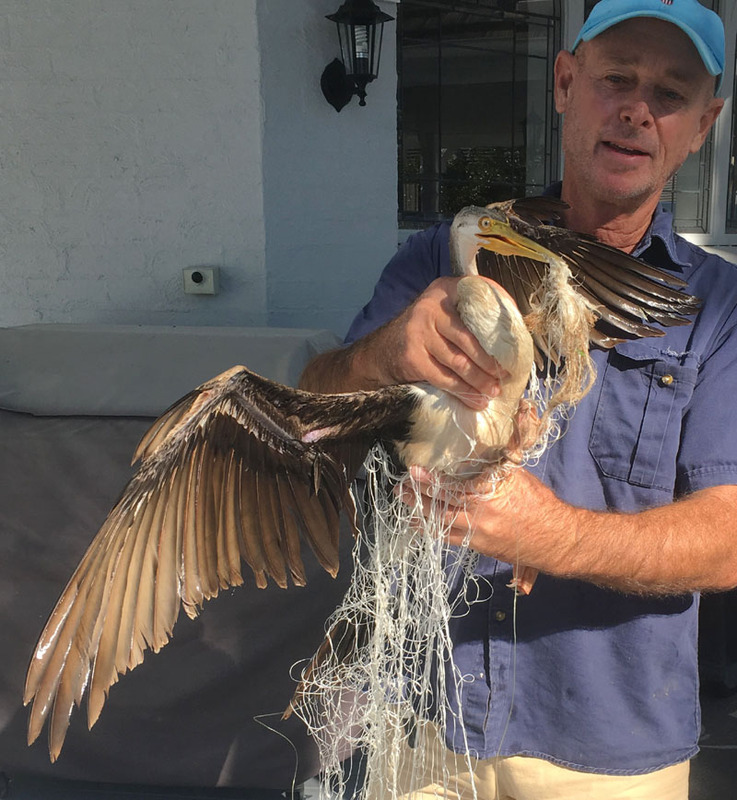 Fishermen, please, when you hook a bird report it to Rowley. He is the one who does the work looking after these injured birds because he cares and does not get enough credit for all his time. Thanks for today Mate. Makes me sleep and feel a lot better knowing that seagull is free and that there is a bloke like you helping these birds out. Regards and best wishes. Thank you for rescuing ibis today at Evandale. We appreciate and respect your quick response and action. Hope many people who has fishing hobbies realize what they done and what will comes back to. Thanks again and wish your action makes this world with a lots of love. Hi Rowley, I met you a couple of times when the swans in our lake had problems. I helped you untangle fishing line attached between two cygnets. I want to congratulate you on a wonderful and informative website. We will most certainly be donating. Also, if there is ever any way we can assist you in rescuing our wonderful wildlife, please let us know. You are our hero. Rowley has helped me here at Robina Lakes on occasions by rescuing baby swans and purple swamp hens. He is a legend and a very kind and caring man. Nothing is too much trouble and his knowledge is amazing. Rowley you are amazing, can’t thank you enough for today and your quick response to my phone call about the swan with the fishing hook stuck in his leg. You are a kind and caring man who deserves more credit than u receive for the time you spend caring for these beautiful swans and wildlife, you are a legend and you are amazing, thank you again Rowley. We’ve nominated Rowley for the Gold Coast Council citizen of the year award for Australia Day 2015. Please everyone get behind him and vote. Can’t think of a more deserving person for the wonderful work he does for our wild birds. He really needs to know that he is appreciated and acknowledged for his assistance. We need to get behind him. Thank you Rowley for the time and energy you gave to rescuing the injured oyster catcher that I found on the Broadwater. I was very upset to see the bird limping and did not know who to turn to. You were there in less than half an hour on that Sunday morning, and even though it flew away, I can not tell you how much I appreciate the fact you went back to the Broadwater for 2 consecutive days searching. Moreover, you caught it, drove it to Currumbin and advocated on its behalf … and provided me with regular updates about its wellbeing. Thank you, it is good to see that Superheroes still exist. We at Nerang wish to thank you for all you have done for us and our swans, especially Noah. We really don’t know how we would have managed with the cygnets without your kind help, knowledge, assistance with their dietary requirements, and the fact you have been so prompt to assist. 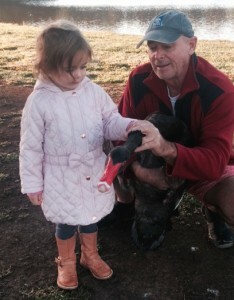 My husband and I often take our three year old daughter Elliette to the lake to hang out with the swans and ducks. There is one black swan with a very individual personality. He likes to chase people and other swans, showing them who’s boss. Yesterday we went to visit and he didn’t chase us! We knew something was wrong becaus e he just stood there on one foot. When he walked he hobbled. We phoned the RSPCA and they passed the call to Rowley who contacted me. He asked us to go back to the lake and try and locate the swan. It was dark and so we took our torches but sadly couldn’t find him. We arranged to meet with Rowley early next morning to capture him and get him to safety. The swan let Rowley walk right up close which made catching it a bit easier, but being a very big and strong bird he was a handful. We quickly saw that one of the swan’s toes was missing a nail. This would have been very painful. His ankle was hot too. Rowley let Elliette pat and name the swan. She called him ‘Coda’. I took Elliette to kindy shortly after. We were so happy to find that the class was focusing on our wildlife for the day and how to keep them safe. Rowley contacted me to say that Coda had been admitted to Currumbin Wildlife Hospital for further examination. I would like to thank Rowley for his kind, hard work and effort that goes into keeping the Gold Coast’s wild birds safe. We called Rowley because we were concerned about a cygnet (baby swan) with fishing line tangled round its feet and a bloody wing. He arrived within 15 minutes, treated the bird and released it to its parents with the minimum of distress to the bird. Rowley is a wonderful man and we shall be making a donation to this worthy cause. Just like to say that you’re an incredibly inspirational person and the world needs more people like you. I cant commend you enough for the effort you put in. Hi Rowley. Just to thank you for all your kindness with keeping our cygnets safe. Margaret and I are so grateful to you and acknowledge how much you know about our wildlife. The way you handle them is amazing. The two adults that have been living on our lake for 12 years are very big, strong birds which you do not realise until you see them on dry land. They are so tall and regal but let you know not to touch them or their cygnets unless you know exactly what you are doing. We have had 60 cygnets born here and thanks to you have lost only a few. 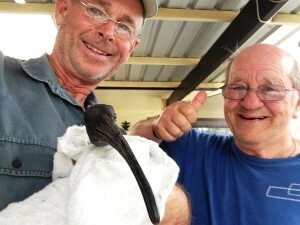 Thankyou Rowley for the time and effort you put into catching and removing the rubber band from around one of our local Upper Coomera magpies neck and beak. I can tell you the magpie is very appreciative as well. He was not at all traumatised by being captured as he has returned to our front lawn with his friends the last two days. Thankyou for also taking the time to explain correct feeding to us as well and being really patient with the kids, educating them and letting them help. Bright and early on a recent Sunday morning I noticed our (wild) darter, which makes regular visits to our canal-side rocks, was shaking its head side to side. We could see something caught on the end of its beak and the bird could not open its mouth. I was at a loss what to do. We didn’t want this dear bird to starve or suffer. After a Google search I found Rowley’s service and placed a call. In twenty minutes he arrived, equipped and ready to assist our darter. Amazing! The sound of the front door closing startled the bird and it flew down the canal but Rowley was not deterred; knocking on neighbouring doors until he located the darter in another backyard. With ingenuity, a borrowed tin of sardines, strength and loads of knowledge, the darter was captured and frayed rope removed from its beak. It was fed fish and thoroughly checked before being released. The next day I phoned Rowley to inform him that our lucky bird friend had returned looking content and well. And in the days since the darter has returned (with friends) to sun, splash in the canal and enjoy its new-found freedom. Rowley is a local legend: a community hero and we thank him for the countless hours he puts in to assist our wildlife here on the Coast. We’ve made a donation and ask others to follow suit to help this amazing work continue. Thank you SO much Rowley! Rowley’s occupation means he lives in a world of hurt and death for many unfortunate native animals. But I’m very pleased to have such a dedicated and skilled wildlife handler to help out whenever possible. For the many animals you have saved R….thank you. Rowley you are a saint and a guardian angel of our feathered friends. The week-long drama that has played out on Lake Hugh Muntz has been traumatizing for resident humans and birds alike. Only due to your intervention has the drama come to an end and the swans are finally safe. Please complete the form below if you’d like to write a brief testimonial about my rescue service. Also add in your suburb.